Have you ever wondered what the most visited SimpleSites look like? 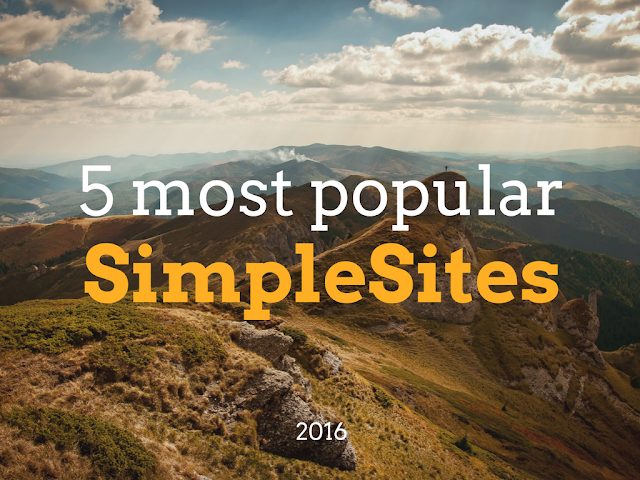 Now you can find out which SimpleSites are the most popular and take a look at them. Below are the current five most visited SimpleSites with a little information about each one. In general, they chose SimpleSite because they could build a website or blog easily – no worrying about html coding or other complicated stuff. Are you ready to build a website or blog? 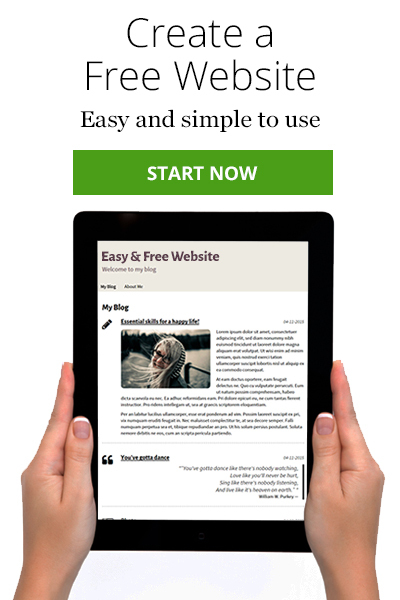 Click the green button to make your own SimpleSite for FREE. 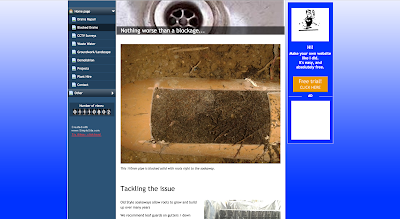 Family-run Bedfordshire Drain Repairs wants to fix your drain system and make sure that it works properly all the time. Of particular importance, they will use CCTV and give you a dvd of your drain system that you can use when selling your property. And if you're looking at property to buy, they'll perform the pre-purchase survey that your lender requires. That inspection will also give you peace of mind about your purchase. Bedfordshire's SimpleSite is very straightforward and easy to navigate with excellent photos to demonstrate their services. If you're in the Bedfordshire, U.K., area and need some of the services they provide, take a look at their SimpleSite. 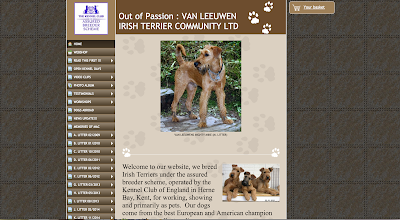 Jean Soeters' passion is most definitely Irish Terriers as he clearly shows on his SimpleSite Out of Passion: Van Leeuwen Irish Terrier Community Ltd. If you want to read about his passion for Irish Terriers and his commitment to the breed, click on 'Read This First !!!' and 'read more' pages from the menu on the left. You'll soon understand his philosophy about who should be allowed to own the breed. You might even be tempted to visit the kennel located in Kent, U.K.
Jean obviously has his hands full with his Irish Terrier kennel, but he felt like people didn't have access to clear information about the breed, and he wanted to share his knowledge. A few years ago, he decided it was time to tell the world about Irish Terriers, but he didn't want to take time away from his dogs to learn coding or a complicated web-building system. That's why he chose SimpleSite. When Jean saw information online that SimpleSite made it easy for non-techie people to build a website, he knew he'd found his solution. In just the few years that his SimpleSite has been online, it has become one of the five most popular SimpleSites. Mark Fox is the creative mind behind The Crocosmia Gardens and has been a serious Crocosmia collector for more than 16 years. If you want to visit, his garden is in Caistor, Lincolnshire, U.K. The purpose of The Crocosmia Gardens SimpleSite is to share information about the flower and to spread knowledge about the wide variety of Crocosmia available that many people don't know about. His SimpleSite not only displays the Crocosmia varieties that he owns and has bred, but also contains historical information about Crocosmia as well as excellent tips about how to take care of your own plants. 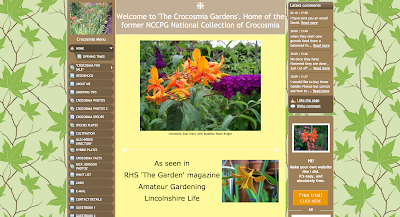 In addition, he provides lists of other sites in both the U.K. and the USA that sell Crocosmia. Mark likes SimpleSite so much that he's started another SimpleSite about caring for hedgehogs. On her SimpleSite, ffiona Erskine of ffire Photography says, "I am nothing special … I just see the world in a special way …"
And her photography, displayed on her SimpleSite, clearly demonstrates the truth of her statement. She has been a self-employed photographer for over eight years and works with her husband Ian who handles the business side. 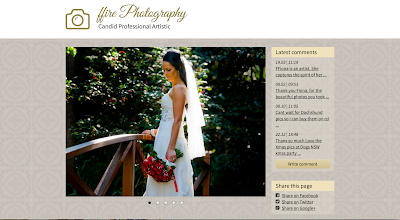 Located in the Sydney, NSW, Australia, area, ffiona currently specializes in shooting weddings and dogs. She says that she loves being the person who captures wedding images of the couple in love. In addition, ffiona is the offficial photographer for the Purina Sydney Royal Dog Show but photographs dogs at many other dog shows as well. Her current project is Chasing Satin. In this case, satin refers to the satin ribbons that can be won at dog shows. This project to help raise money for cancer research started out small to be a calendar of artistic shots of dogs with models. But it just kept growing. ffiona ended up with more shots for the calendar than she needs and is also making a documentary. Check out her SimpleSite – you might be tempted to turn your dog into a model. 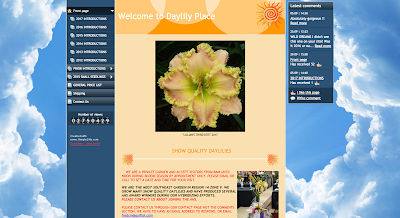 Visit Daylily Place online and you will be rewarded with images of beautiful daylilies that owners Fred and Kathleen Manning have shown and/or hybridized themselves. The Mannings have been involved with daylilies for more than 13 years. They've won several awards from the American Horticultural Society, and each year, they introduce daylily versions they have hybridized. Fortunately for flower lovers, Daylily Place is a commercial and display garden that can be visited by appointment at their location on the Gulf Coast of Alabama. Just contact them through the contact page on their SimpleSite. If you can't make a visit in person, don't worry. The Mannings have made a gorgeous display on their SimpleSite, which is easy to navigate. The images of their flowers are so enticing that you'll probably spend longer than anticipated browsing them and end up with a long list you want to order. But don't hesitate. Some of their stock sells out very fast. Ready to Build Your Own SimpleSite? Take a look at these popular SimpleSites to get ideas for building your own. You can get started for FREE – just click the green button.